On Sunday July 1st BABA teamed up with several other sponsors to hold the 6th Mayo Beach Fun Fest. July weather was out in full force with tons of sun, temps in the very high 80’s and a light southerly breeze. Everyone was looking for shade and we all couldn’t wait to jump in the water. Offering Taste of Windsurfing lessons is a big part of this annual event. It is always fun to share in the excitement of the 18 windsurfing recruits as they completed new skills – up-hauling, 180 turns, sailing position and sailing away. Their confidence in practicing these skills on land quickly transitions into a big challenge – balancing on the board that is moving all around in the moderate chop, raising the sail that has a lot of water on it, and finally grabbing the booms and sailing. Big cheers go up as new windsurfers meet the challenge by balancing on the board through all of these moves and sailing forward and away from the group. Extra credit is a graceful turn and exit from the board before hitting the beach or another group. East of Maui (EOM) joined us again this year offering Standup Paddle (SUP) board quick lessons and free demonstrations. The demo boards were in constant use with a lot of people trying out the equipment and this rapidly expanding water sport. Mark Bandy from EOM also had a windsurfing foil setup, which a few people tried in the very light wind. BABA and Outdoor Architects provided food and drink for the event giving the 80-some Fun Fest participants a chance to cool down in the shaded picnic area of Mayo Beach 3 and to connect with long time BABA friends and to meet new people from all over Maryland, Virginia, Delaware, Pennsylvania and North Carolina. This year we had over 77 Fun Fest registrants and drop-ins with 19 people participating in Taste of Windsurfing. Most of whom went into the water We were happy to meet a lot of new water sport enthusiasts from all over the world! In Partnership with – Anne Arundel County Recreation and Parks. My wife Ann and I moved to Annapolis in 1991 having caught the windsurfing bug in central PA where the only sail-able water was at state parks with human-made lakes, which were drained in late September for flood prevention. We were over-the-moon ecstatic with all of the water in Maryland and when we found a relatively new group – the Baltimore Area Boardsailing Association – that provided races, trips and comradery. And BABA is still doing it some 27 years later! It is always fun to get together with BABA friends and to share our fun sport with new enthusiasts. On Sunday July 9th BABA teamed up with several other sponsors to hold the 5th Mayo Beach Fun Fest. Low 80 degree temperatures and low humidity made it a perfect day at Mayo beach watching ships and yachts on the bay, a new family of osprey and lots of first time windsurfers and stand-up paddlers. This year we had over 70 Fun Fest registrants and drop-ins with 22 people participating in Taste of Windsurfing. We were happy to meet a lot of new watersport enthusiasts from all over the world! 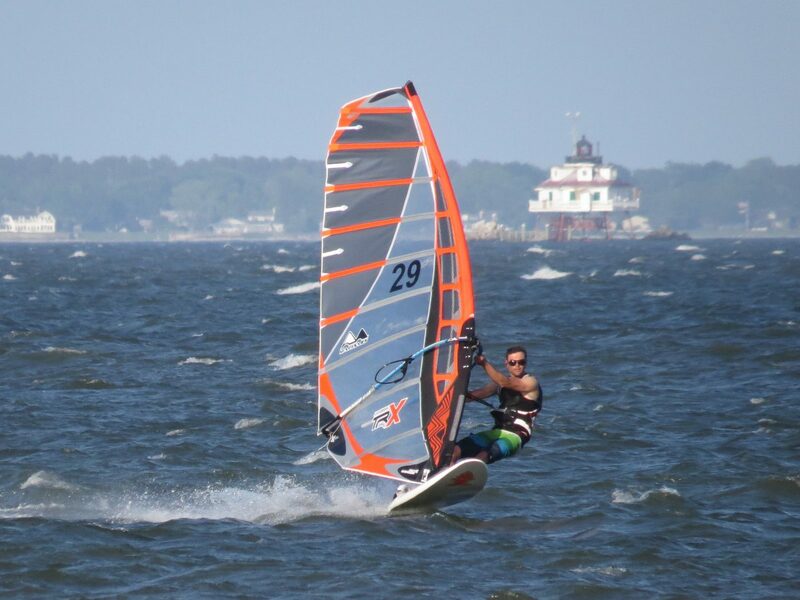 The squirrely, light off-shore wind along with some mild chop presented a challenge that Fun Fest participants met with enthusiasm – accomplishing dry up-hauls, 180 degree turns and sailing off to the horizon with BABA in-water mentors bouncing along in waste deep water to keep up. A special thanks to Daphne Lathouras and Mark Sarrasin who organized the Taste of Windsurfing activity and taught the lessons and to all of the in-water teachers. Mark Bandy from East of Maui joined us again this year offering free SUP demos and different boards to try. Many of the participants took advantage of the opportunity for the first time and had a blast. Steve Uthoff organized our first mixed fleet (windsurfer and then SUP) relay race with a simple off-shore gate course and relay exchanges inside the stone breakwaters. Team Steve took the honors with team Mark coming in 2nd. We should definitely do this again! After many years as a BABA member, it is still fun to get together with BABA friends and to share our fun sport together and with new enthusiasts. Mayo Beach Park in Mayo MD sits right at the mouth of the South River and the Chesapeake Bay on the southern side of the river. You must have a permit to use the Mayo launch. Keep reading for more information. Best wind direction is SE and S, but East and NE are also great. North, NW and West can be OK but if you break down its a long drift to the east shore. The launch site has a grassy rigging area and sandy beach, lots of parking, bathrooms, showers and picnic benches. The water is shallow for the first 200-300 meters then drops off. The river swell can get very large depending on the tide. 2-3 feet is normal for winds in the 12-18 knot range and it can get significantly larger in higher winds. The swell is the long rolling variety but can get choppy with increased boat traffic. The water on the inside is good for beginners and the outside swell is good enough to loop. This site is good for all levels. Mayo Wind Permits – a permit is required to use this launch. Search on key words “Mayo Wind.” If you are requesting a new permit you’ll be mailed a sticker. The combination for the lock, and Mayo Usage Rules will be emailed to you at a later date. If you don’t receive the combination for the gate lock before you go to Mayo you may or may not be able to gain access. Find a park staff member, show them your permit receipt and ask if they can let you in. DO NOT ask other windsurfers to let you in – this jeopardizes access for everyone because it is strictly against the rules to share the gate combination. Keep the gate locked at all times (let yourself in, then immediately lock the gate behind you). Keep reading for more information on Public Open Days, Summer Access etc…. Location: Annapolis, Severn River, next to the Horn Point shoal pole. The closest launch available is Horn Point Park at the end of Chesapeake Avenue. When: First gun between 6:15 – 6:30 PM. Requirements: We will have a 5 knot minimum. We will check the forecast in mid-afternoon, looking at both the Annapolis buoy AND Thomas Point Lighthouse. If both locations confirm less than 5 knots forecast, we will join again the following Tuesday. We will post Race/No Race on BABA Facebook page, More_Downhaul Yahoo Group and by email. Details: Bring what you want to sail. There will be 2 courses set: Triangle and Figure-8. TuesdayNightAgenda – includes the start sequence and other information. Tuesday_WindsurfCOURSE – has the course diagrams. 2 classes: Open Unlimited and Slalom. Committee Boat: Boston Whaler, anchored near the Horn Point shoal pole. WAIVER: You must sign the BABA Waiver to race!!! Click here to get the Waiver. Turn in your waiver to me or Daphne. One waiver is valid for the entire series. The Goal: HAVE FUN WITH FELLOW WINDSURFERS AND GAIN SOME SAILING ABILITIES! Timeframe:We will run the races as long as we continue to have 3 or more people show up consistently. We hope to sail until October. First series: May 16 – June 27. Party: Join in the party with East Of Maui on Tuesday nights at Boatyard Bar and Grill or other local joints after we de-rig and pack-up. If you have questions, feel free to email or call me. If you would like to get on the list for Race/No Race announcement, send me your email.